The Hurt Locker is the first American film that directly deals with the war in Iraq. It's wonderfully done, shot in a documentary/cinéma verité style: jerky camera movements, and overexposed outdoor sequences give a powerful sense of the metaphoric harshness in that part of the world. The viewer feels forced to squint as if he or she were there beside the characters. The story line concerns three American soldiers whose job is to defuse unexploded bombs before they wreak their mayhem on soldiers and civilians alike. The plot line is compelling and very similar to a British television drama from the 1970s - "Danger UXB" which tracked the lives of a bomb disposal unit in London during the blitz. In Iraq the danger to the unit was from Iraqi snipers; in London, it was from German bombers. The tension in The Hurt Locker is constant. As a viewer, it felt as though I were there, hoping that the characters would survive another day to end their tour of duty intact. At the same time, each character is shown to be utterly human and flawed in some way which you fear may have consequences. Of course, there are terrible consequences. There's an old expression: "when you are a hammer, everything looks like a nail." So I couldn't help thinking that the film says a lot about news organizations and news management. The three protagonists are a lot like reporters and editors in a news organization. They know their job, they follow orders, no matter how absurd they may seem. The soldier/journalists are alienated from the organization overall even as they acknowledge the importance of the mission. And they resent anything that may get in their way of doing the job. In short, they are professionals. Their superior officers are portrayed as martinets and fools, who when they deign to speak to the troops, do so in a language that is disconnected, nonsensical and self-aggrandizing. This allows the audience immediately to sympathize with the plight of the soldiers. We groan inwardly as officers opine in a completely facile way about the job at hand. "How is it," you wonder, "did those men get promoted to be officers?" My guess is that they demonstrated the appropriate skills when they were enlisted men and women, but somehow forgot lost something - such as an ability to communicate - on the way up. Newsrooms can also be like that. Reporters who do well are promoted to editors. Editors are promoted into management. But the skills of skepticism and straight talk that are so valuable in the lower ranks of the organization often don't travel well up the line. Officers and management see a loyalty to the larger organization and somehow forget the values that served them so well in the lower ranks. In the process, the culture of the newsroom floor/platoon becomes increasingly divorced from the culture of management/the officer corps. 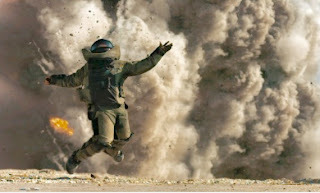 The Hurt Locker is an effective film, but it never really goes beyond the emotional stereotypes that lock the characters into their roles that drive the plot forward. It's just not possible that all enlisted men are flawed heroes and all officers are idiots. But the film deepens the sense of alienation within the ranks, without ever allowing nuance or subtlety to emerge as it often does in news organizations or within the military. I saw the movie too and enjoyed it, but your analysis of the parallels to a newsroom are intriguing, given the insane news coverage of the current health insurance reform debate in the United States. To continue the parallel: the Hurt Locker's insanity is the war in Iraq; ours is the insanity of arguing misinformation with information on cable news. And it looks like any health insurance reform proposal will blow up in all of our faces.